Having struggled with acne-prone skin since I was young, I’m always on the lookout for the fastest way to get rid of a pimple (or four). Acne begins in most people between the ages of 10 and 13 and lasts into your twenties, and women are prone to having mild to moderate forms of acne in their thirties and beyond. Most people have experienced pimples at one point or another. Pimples are an inflammation of the skin where the oil gland becomes infected with bacteria. Excess sebum secretion by the oil glands is often the primary cause of acne. Some people struggle with acne for years, while others only get pimples from time to time. Either way, everyone knows what a pain it can be. If you’re struggling with pimples, today we’re letting you in on how to get rid of acne overnight. Great skin starts with proper skin care. The thing about acne is it’s linked to hormones. You could be taking excellent care of your skin and still have acne, and you could take horrible care of your skin and not see a pimple for months. The below are steps you can take to care for your skin and try to get rid of acne the best you can. If you struggle with severe acne, please see your doctor or dermatologist! You should be washing your face as soon as you wake up and when you go to bed at night (especially the latter!). Sleeping with your makeup on can leave your skin oily and clog your pores. Wash your face with warm water and a cleanser made for sensitive or acne-prone skin (I swear by La Roche-Posay’s Effaclar Dermatological Acne Treatment System. I’ve been using it for 12+ years and it’s been a lifesaver in the pimple department!). It’s best not to scrub your skin with a washcloth or loofah – clean your skin gently with your hands or a soft towel. And always dry your face with a clean towel since germs spread really easily on towels. It can be tempting to cover up your breakout with makeup, but it’s actually best to let your skin breathe. If you absolutely have to wear makeup during a breakout, make sure it’s oil-free and noncomedogenic, so it doesn’t block your pores. Neutrogena’s Skinclearing Blemish Concealer is a great option. What shows up on your skin can be a direct reflection of what you eat and drink. Greasy, sugary foods are known to cause skin issues, as is dairy. Fill your body with fresh, whole foods as much as you can, and avoid processed and fast foods that may trigger acne. Exercise is amazing for your skin. It helps nourish your skin cells, giving you a gorgeous glow. Working out helps your body get rid of toxins, which in turn helps your skin get healthy. Just make sure to avoid wearing clothes that may irritate your skin when you exercise, and shower right after! Breakouts seem to have the worst timing, don’t they? They always seem to hit before an important event, a vacation or a night out on the town. If you want to know how to get rid of pimples fast, read on. Before we get into the acne remedies, keep in mind that everyone’s skin is different. What works really well for some, may not work for others. If you have sensitive, acne-prone skin, make sure to test out these remedies on a small spot on your skin before going all out. If you notice irritation or if it makes your breakout worse, it’s not the right remedy for you. Toothpaste is a go-to remedy to get rid of pimples overnight. It dries out the pimple, and its antibacterial properties eliminate bacteria. Use a white toothpaste (not a gel), and apply a generous amount to your pimples with a cotton swab. Leave it on overnight and let it work its magic. Extracted from the leaves of the Melaleuca alternifolia tree, tea tree oil has been found to work well for acne prone skin. It reduces inflammation and fights bacteria, specifically P. acnes and S. epidermidis, which are known to cause pimples. Many acne medicines tend to dry out your skin, but tea tree oil won’t dry, irritate or burn your skin. Keep in mind, it should be diluted with water or a carrier oil, as direct contact with the skin can cause redness and irritation. This delicious Asian oil isn’t just for cooking. Sesame oil contains protein and an antioxidant compound called sesamol. It can help unclog your pores, and since it contains vitamins A and E, it helps smooth your skin overall. Soak cotton balls in sesame oil and apply to your skin. Leave it on for about 20 minutes and wash off with a mild cleanser. You can also leave it on overnight! Apple cider vinegar is an antimicrobial agent that reduces bacteria in the skin. Its mild acids are able to control the oil production of the skin and act as an astringent. Apply ACV to your skin and leave it on for five to seven minutes. Green tea isn’t just for drinking, its awesome anti-oxidant effects also help when applied directly to the skin. Green tea helps fight inflammation that may cause pimples due to its high content of flavonoids and tannins. Steep a green tea bag and apply it to affected areas. A few drops of lavender essential oil may be just what you need to clear acne fast. It has antibacterial and antifungal properties, as well as antioxidants that help heal acne. Apply a drop on your pimples, let it air dry and reapply after a few hours, or leave it on overnight. Lemon juice is rich in vitamin C, and helps pimples dry up fast. Stay away from bottled lemon juice as it contains preservatives, and stick to fresh lemons. You can dip a cotton swab in lemon juice and apply it to your pimples before bed, or you can mix one tablespoon of lemon juice with one tablespoon of cinnamon and leave it on your skin overnight. In the morning, wash it off with warm water. Steaming your skin opens up your pores, allowing your skin to breathe. It’s amazing for your skin, especially when you’re experiencing a breakout. Steaming helps get rid of oils, dirt and bacteria in your pores that can cause inflammation. Boil a small pot of hot water, pour it into a bowl and steam your face with a towel over your head. You can even add essential oils if you like! Not only is aloe vera a healing and anti-inflammatory substance, it also contains salicylic acid and sulfur, which are both commonly used in acne treatments. Scrape the gel from an aloe plant with a spoon and apply it to your pimples. Aspirin contains salicylic acid, which can help treat acne. Crush an aspirin pill and add it to water to form a paste. It can be used as a spot treatment overnight! Honey and cinnamon are both excellent sources of antioxidants that fight bacteria and reduce inflammation, making acne less likely to surface. They have strong antibacterial and anti-inflammatory properties that can make your pimples disappear fast. Ice is a vasoconstrictor and decreases blood supply and inflammation in the pimple. It can reduce swelling and redness, taking your pimple down a few notches. Wrap an icecube in a paper towel and apply it to your pimple for a few minutes. Remember that it can burn your skin if left on for too long. Pimples and breakouts are a normal part of life, but when they hit they, it’s great to know remedies to get rid of them fast! 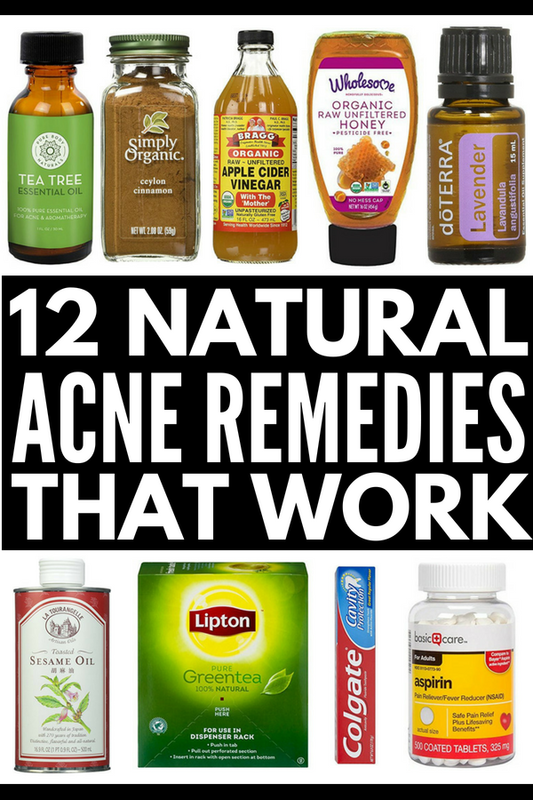 If you loved this post on how to get rid of acne overnight, please share it on Pinterest. And if you want more skincare tips and tricks, follow our Great Skin board on Pinterest!